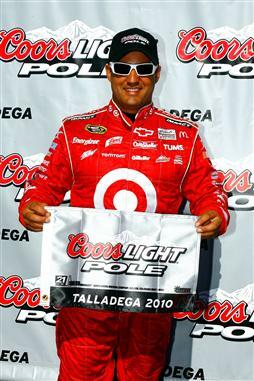 Drawing an early run through afternoon time trials, Juan Pablo Montoya placed the #42 Target-sponsored Chevrolet on pole for Sunday's AMP Energy 500 at Talladega Superspeedway. Only the 6th car set to take the track, Montoya's Earnhardt-Childress Racing (ECR) Engine benefited with the earlier, cooler conditions to circulate around the 2.66 mile tri-oval in 51.863 seconds or 184.640 miles per hour. Undefeated in competition on NASCAR Sprint Cup restrictor plate races this season, the ECR engine program has yet another reason to celebrate as Montoya and Richard Childress Racing's #33 Chevrolet of Clint Bowyer occupy the front row. Kurt Busch provided a strong run for the 3rd fastast run in qualifying with his Penske Racing #2 Dodge while Joe Nemecheck provides a minor surprise by rushing his #87 Toyota into 4th place. Saying it's a minor surprise, it is typical on restrictor plate tracks that smaller, underfunded teams like Nemechek's independent effort will take measures to add horsepower which is inadvisable but worthwhile in gaining a higher field presence in the race. Several other cars including the #36 Chevrolet of Tommy Baldwin Racing, the #13 Germain Racing Toyota, a second Nemechek #97 Toyota and the #46 Chevy owned by Dusty Whitney are shaped within the top-15 of the AMP Energy 500. In relations to the ever-more important Chase for the Sprint Cup as only 3 races remain after Talladega, the top-two drivers in points have taken conservative runs through superspeedway qualifying. Denny Hamlin qualified 17th while Jimmie Johnson is 19th. For the #11 Toyota of Hamlin, his starting spot is the highest for the Joe Gibbs Racing team with Joey Logano placing 25th and Kyle Busch buried early in 32rd spot. In the Hendrick Motorsports stable, Jeff Gordon as well as Mark Martin will start just ahead of Kyle Busch's #18 Toyota in 30th and 31st positions. From the drop of the green flag, revered but embattled superspeedway driver Dale Earnhardt Jr #88 Chevy team leads the Hendrick drivers with a 6th place result after qualifying. While speeds have been contained under the 185-mile per hour range for single-car qualifying, practice speeds in multiple-vehicle drafting conditions have seen NASCAR Sprint Cup cars flying more than 12 miles per hour faster. Talladega Superspeedway, the 2.66 mile tri-oval is immediately going allow drivers to gain considerable ground within a span of a single lap. Conversely, the track also presents NASCAR Sprint Cup drivers an invitation to make a smallest mistake which will either cost positions or even their race car. The 'Big Wreck' is always a high probability at Talladega and been known to change everything. Drivers in tight points battles inside and outside of the NASCAR Chase for the Sprint Cup will be on edge for 188 laps Sunday.